More than a thousand years before the first telescopes, Babylonian astronomers tracked the motion of planets across the night sky using simple arithmetic. But a newly translated text reveals that these ancient stargazers also used a far more advanced method, one that foreshadows the development of calculus over a thousand years later. It’s a well-known fact that the Babylonians were skilled mathematical astronomers, who preserved their knowledge on hundreds of clay tablets. But when astroarchaeologist Matthieu Ossendrijver of Humboldt University in Berlin translated an unstudied text on Jupiter, he discovered something astonishing. To track the gas giant’s path across the sky, the Babylonians used a geometric technique—the so-called trapezoid procedure—that’s a cornerstone of modern calculus. Until now, this method was believed to have been developed in medieval Europe, some 1,400 years later. The text belongs to a collection of thousands of clay tablets, inscribed with cuneiform and excavated in Iraq during the 19th century. By translating and studying them over the past century, archeologists have learned a great deal about Babylonians, including their advanced system of astronomy, which grew out of the development of the zodiac around 400 BCE. Also priests, Babylonian astronomers believed that all Earthly happenings—the weather, the price of grain, the level of the rivers—were connected to the motion of the planets and stars. 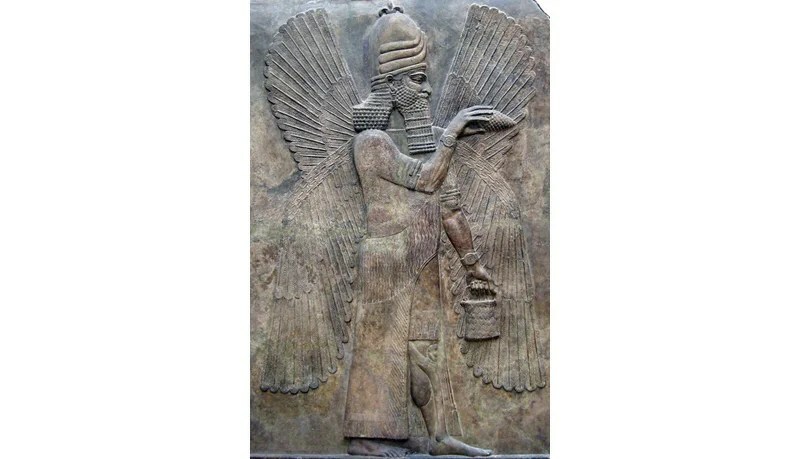 And of all the forces influencing our world from above, none were as important as Marduk, the patron deity of Babylon. He was associated with Jupiter. As Ossendrijver explains in his paper, approximately 340 known Babylonian astronomy tablets are filled with data on planetary and lunar positions, arranged in rows and columns like a spreadsheet. Another 110 are procedural, with instructions describing the arithmetical operations (addition, subtraction, and multiplication) used to compute the positions of celestial objects. But one collection—a set of four tablets on the position of Jupiter—appears to preserve portions of a procedure for calculating the area under a curve. These texts are fragmentary, and for decades their astronomical significance went unnoted. In 2014, Ossendrijver discovered their instruction book: a tablet, he said, that “just fell through the cracks,” and has been collecting dust in the British Museum since 1881. The now-decoded “text A” describes a procedure for calculating Jupiter’s displacement across the ecliptic plane, the path that the Sun appears to trace through the stars, over the course of a year. 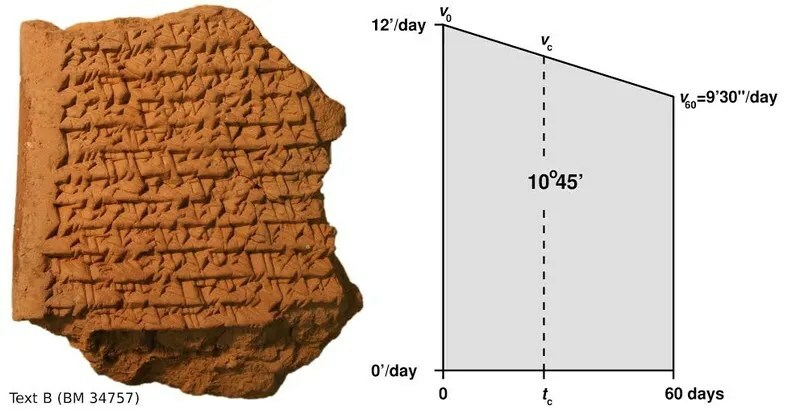 According to the text, the Babylonians did so by tracking Jupiter’s speed as a function of time and determining the area under a time-velocity curve. In Ossendrijver’s view, it’s unlikely that this method survived the vast gulf of time between the disappearance of Babylonian culture and its emergence in medieval Europe. “I think it’s more likely they [Europeans] developed it independently,” he said, noting that the trapezoid procedure doesn’t appear to have been popular among Babylonian astronomers, and that much of their knowledge was lost when the culture died out around 100 A.D.